Today, November 15, we celebrate the feast day of Saint Albert the Great (1206-1280), Doctor of the Church, bishop, teacher, theologian, and one of the Church’s greatest intellects. Widely admired for his wisdom and learning, he was known as “Albertus Magnus” to his contemporaries (“Albert the Great”), and by those who came after him as “Doctor universalis” (“Teacher of all that there is to know”). Saint Albert is the patron saint of scientists. His works constantly remind us of the importance of both faith and reason, and that there can be no separation between these—in fact, faith and reason reinforce and sustain each other. Albert was born the son of a military Lord in service to Emperor Frederick II. The family lived in Lauingen on the Danube, near Ulm, Germany. His parents were wealthy, which afforded him the finest education. Also quite pious, they instructed him in the ways of the faith. As a child, he was drawn to scientific pursuits, and demonstrated an unexpected aptitude for reasoning given his age. So advanced was his thinking, he began studying humanities and natural sciences at the university of Bologna at just 15. The university, closely associated with the Dominican Order, drew Albert closer to his commitment to serving the Lord. This was further fired by the arrival of Blessed Reginald of Orleans, a Dominican preacher and former professor in Paris, who arrived at the college to preach. Not long after, a second Dominican, Blessed Jordan of Saxony, arrived in Padua. An eloquent preacher, he drew many—including young Albert—toward religious life. Albert’s family was opposed to his entering the Order, given his youth and exceptional scientific prowess, but Albert was torn. One night, in his dreams, he saw himself entering the order, only to depart soon afterwards. The very next day, he heard Blessed Jordan preach, specifically about how the Devil turns those who would enter religious orders away from their calling through dreams and false promises. After Mass, Albert found Blessed Jordan, inquiring: “Master, who revealed my heart to you?” He subsequently entered the Order that summer, at the age of 16. As a Dominican, Albert continued his studies, earning a Doctorate in theology. He obediently taught, wherever he was sent, traveling to Cologne, Padua, Bologna, Saxony, Fribourg, Ratisbonne, and Strasbourg. In each of these places he attracted numerous disciples, some of them destined for illustrious careers. However, Albert himself remained humble and focused only o the Lord. When Blessed Jordan died in 1237, Albert assumed his duties as General until his successor was elected. At that point, he returned to Cologne, where he was to meet his most illustrious disciple, Saint Thomas Aquinas. While his classmates saw Thomas as a mute and unlearned man, Albert recognized in him the grace and glory of the Lord. Together, they traveled to the University of Paris, where Saint Albert’s theology and philosophy blossomed and changed the manner in which the world thought. While he wrote many scientific works, he was, first and foremost, a Catholic. Gifted with encyclopedic knowledge, he used this gift in service to the Church. He used his reason and thinking diligently. He was a brilliant scholar, student and seeker for truth. His writings fill thirty-eight volumes. His explanations on vast subjects took twenty years to complete. Albert possessed boundless writing energies and wrote exclusively on natural science, logic, rhetoric, mathematics, astronomy, ethics, economics, politics, metaphysics, physics, mineralogy, chemistry, biology, botany and human/animal physiology. While Saint Albert would have been quite content to remain in Paris, writing and teaching, obedience to his Order bade him travel back to Germany when he was elected Provincial. He thereafter served his community, traveling to all the monasteries in his jurisdiction by foot, without any money, across long distances—Austria, Bavaria, Saxony, and Holland. In 1260, he was appointed bishop of Regensberg. After three years, he was permitted to resign, but was subsequently called to be an adviser to the pope and was sent on several diplomatic missions. 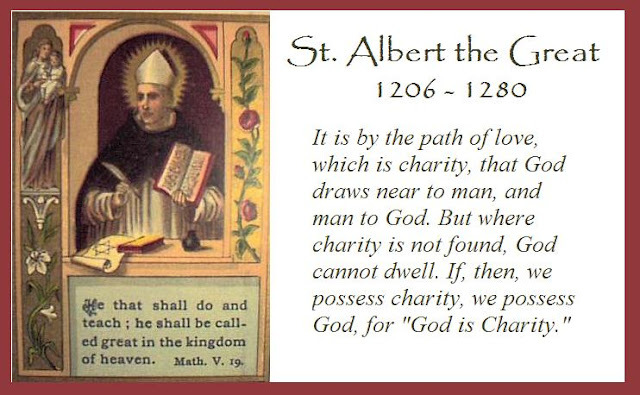 Amid his journeys and works of zeal, Saint Albert found the time to write his thirty-eight volumes on the natural sciences, philosophy and theology. Saint Albert died, apparently of fatigue, at the age of seventy-three. His body was buried at the Dominican Church, Saint Andrea’s, in Cologne. Three years after his death, his body was in a state of perfect preservation and his body exuded the delightful fragrance or sanctity recorded at the graves of many saints. Miraculous healings were reported at his tomb side. Others received visions that were recorded due to Albert's intercession. His relics continue to be venerated there today. It is often said of Saint Albert the Great: "He was great in science, greater in philosophy, greatest in theology." He discovered a science above all other sciences—the knowledge that only God can impart, a heavenly wisdom that comes when reason and faith are joined together in charity towards others in prayer and action. Saint Albert reminds us not to rely on anything or trust anyone more than God. In this trust, faith and reason unite, leading us toward a greater knowledge of eternity. "There are some people who attribute all these things to divine order and say that we must not consider in them any other cause but the will of God. This in part we can agree to. Yet we do not say that he does this because of a natural cause of which he is the first mover, since he is the cause of all movement; for we are not seeking a reason or explanation of the divine will but rather investigating natural causes which are as instruments through which God's will is manifested. It is not sufficient to know these things in a general sort of way; what we are looking for is the cause of each individual thing according to the nature belonging to it. This is the best and most perfect kind of knowledge." you endowed St. Albert with the talent of combining human wisdom with divine faith. Keep us true to his teachings that the advance of human knowledge may deepen our knowledge and love of you. Grant this through our Lord Jesus Christ, your Son, who lives and reigns with you and the Holy Spirit, one God, for ever and ever. Amen.